These irregularly sized, oddly shaped, all-varieties-of-brown-colors eggs are the real deal: they come from chickens that eat not just chicken feed but live bugs and green grass, and incidentally get to spend plenty of time in sunlight and fresh air. The results: At the start of the summer, we made what felt like several gallons of ice cream, plus angel food cake (the yolks went into the ice cream, the whites into the cake). But a dozen eggs can disappear fast that way. And, really, the eggs are so delicious — and their yolks such a vivid orange — that it seemed a shame to not eat them all on their own. Now that CSA season is winding down, the eggs are getting smaller, and soon they'll be gone. So we're savoring them, one by one, by putting them in a small saucepan of water, bringing the water to a boil, turning the heat down to low, and simmering them for just four or five minutes. 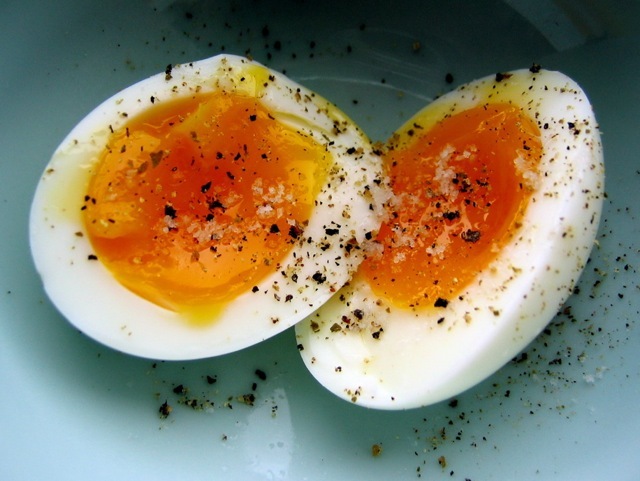 Sliced in half and dusted with pepper and salt, they're soft-boiled satisfaction itself. Editor's note: Until Friday, October 12, 2007 at noon (PST), all commenters on this post will be entered in a contest to win a copy of Hungry Planet. See Our Table for further explanation. \....Congratulations to Aaron from Chapel Hill, NC who won a copy of this wonderful book.